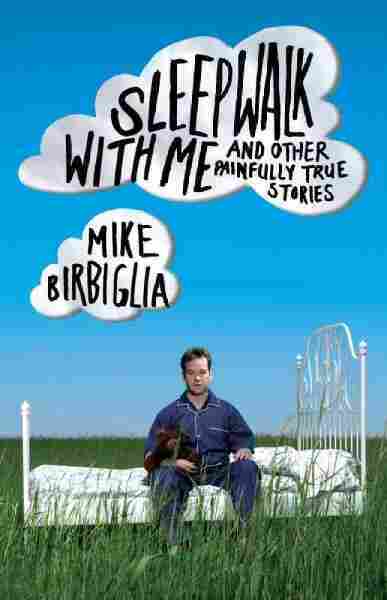 Spending The Night With Sleepwalker Mike Birbiglia Comedian Mike Birbiglia has a disorder that makes him sleepwalk. He recounts his worst episode — as well as other painfully embarrassing moments — in his comedic memoir, Sleepwalk With Me. Comedian Mike Birbiglia was on tour in Washington state when he had a dream that a guided missile was heading toward his hotel room. In his dream -- and in real life -- Birbiglia decided to jump out the window of his hotel room. He was staying on the second floor. Birbiglia survived, receiving 33 stitches for gashes in his legs. When he returned home to New York, he was sent to a sleep physician for overnight observation. "They put the electrodes all over my body and observed my sleep and I was diagnosed with REM behavior disorder, where people have a dopamine deficiency," he tells Fresh Air's Terry Gross. "Dopamine is the chemical that is released from your brain into your body when you fall asleep that paralyzes your body so you don't act out your dreams. And people who have this [disorder] are typically running away from some type of demon or wild animal -- and people who have this, in rare instances, have actually killed people while remaining asleep." Birbiglia recounts the events leading up to his near-death experience in Washington in his new comedic memoir, Sleepwalk With Me. The book details several painfully embarrassing moments from his childhood, his recovery from bladder cancer in college and his failed dating experiences that led, eventually, to his sleepwalking episodes. "Comedy is tragedy plus time, but the time is different for everybody," Birbiglia says. "I tell some of these stories and people in my family are like 'Why are you telling these stories?'" 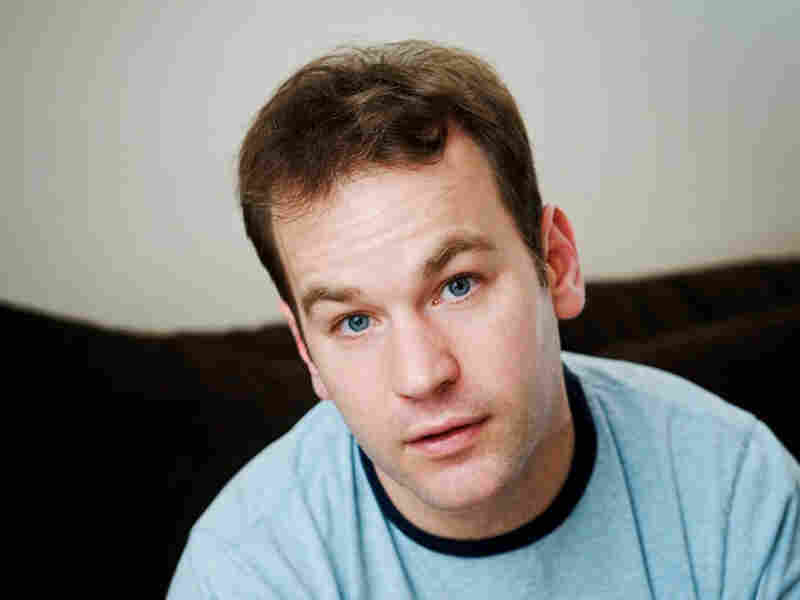 Birbiglia is a regular contributor to This American Life and has performed in three Comedy Central specials. His one man show Sleepwalk With Me, produced by Nathan Lane, was called "simply perfect" by The New York Times. In his blog My Secret Public Journal, he chronicles painfully embarrassing moments in a public forum. 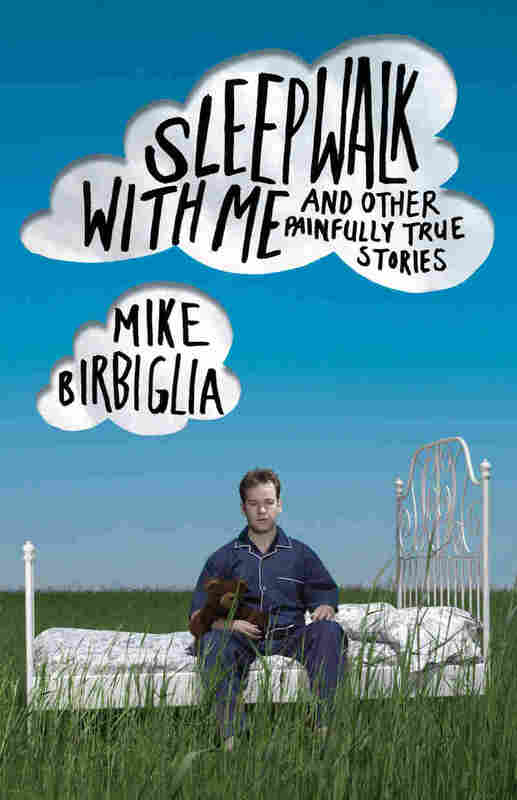 Comedian — and somnambulist — Mike Birbiglia chronicles his sleepwalking and his recovery from bladder cancer in Sleepwalk with Me. "My father would say, 'The more people know about you, the more they can use it against you.' Which always sent shivers down my spine 'cause it has like an open-ended fear to it -- like the fear you have when you're driving and you see a cop and you're not speeding and you don't have drugs, but you think, 'I hope he doesn't notice I'm driving.' Ten-and-two, sitting upright. But I think my mom and other people have said, 'It's a very Italian trait.' My dad is up a few generations back but of Sicilian descent and my sister Patti has said to me that when she went to visit Sicily, [people there] have that kind of mentality. ... I think that's how I ended up being a comedian, as a reaction to that mentality." "It's very exciting for people at City Hall when Nathan shows up. He's kind of like the mayor of New York. ... The woman who was behind the glass kind of fingers me to come over and I walk over and she goes, 'Is that Nathan Lane?' and I go, 'Yeah' and she goes, 'Oh. We're going to get you a private room.' So we went over and she says, 'The last celebrity who was here was Tony Randall,' which was like seven years or eight years before and he was getting married himself, I guess. And she said, 'And [Randall] said, 'I do not want special treatment,' so he did not go to the front of the line, I guess. And Nathan goes, 'Well, I want special treatment.' He did not want to wait there. So we went into this private room and yeah, we got married." "In 2003, I was asked to tell a story at the U.S. Comedy Arts Festival in Aspen, Colo. -- and that was the first time I ever told a story onstage and it was completely terrifying and it was one of the things that spun me into telling stories and eventually, I became a semi-regular on [the live storytelling series The Moth] in New York. Eventually, when I told the sleepwalking story, I asked Catherine Burns, who is the director [of The Moth] if she would send it over to This American Life because I was a big fan of the show and I had listened to it for many years and I thought it would be a good fit. And she said no. And then I asked her again and she said no. And then I think the third or fourth time, she said yes. She wasn't being mean, she just didn't want to bother them. They're very busy. So I said, 'Can we just do it in the studio?' and Julie said, 'No, we really want the live one,' and then finally I get a phone call from Ira [Glass] one day, who I'd never met and he's like 'Hi Mike, it's Ira Glass. I'm calling to convince you to let us use the live version of your show for our show.' And I was like 'Sure. Great.' Instantly sold. The power of a celebrity voice -- and [since] then all of my pieces on the show have been live pieces." I'm sitting at a Starbucks in Manhattan. Starbucks is the last public space with chairs. It's a shower for homeless people. And it's a place you can write all day. The baristas don't glare at you. They don't even look at you. Every once in a while they walk around with free samples of banana-chocolate something. "No thanks. Just the two-dollar coffee" -- cheapest rent in New York. Plus, they sell CDs and even Christmas gifts. If this place sold toilet paper, I probably wouldn't have to shop anywhere else. Well, the reason I'm writing is that I want to tell you some stories. And they're true. I always have to point this out because whenever I tell stories, people ask me, "Was that true?" And they say, "Was it?" And I don't know how to respond to that. I guess I could say it louder. "Yeah!" "It's probably true. He said it louder." Growing up, I was discouraged from telling personal stories. My dad often used the phrase "Don't tell anyone." But not about creepy things. I don't want to lead you down the wrong path. It would be about insignificant things. Like I wouldn't make the soccer team and my father would say, "Don't tell anyone." And I would say, "They're gonna know when they show up to the games and I'm not on the team and I'm crying." One time I built up the courage to ask him about this, which was tough because my dad is a very serious man. He's a doctor -- a neurologist. When he's home, he spends most of his time in this one armchair reading these thick war novels. My dad goes through war novels like I go through boxes of Cinnamon Toast Crunch. So I built up the courage to ask, "How come you play everything so close to the vest?" My dad said, "The more people know about you, the more they can use it against you." This sent shivers down my spine because it had that kind of open-ended fear to it -- like that feeling you get when you're driving and you see a cop. And you're not speeding. You don't have drugs. But you're just thinking, I hope he doesn't notice I'm driving. Once in a while I told personal stories at the dinner table and my father would say, "Hush!" I'll give you an example. In grade school, I was a terrible reader. We used to do these things at school called Student Reading Assignments, and the teacher would post on the wall a list of how many everyone had done -- which is a great way to squash a child's self-esteem. I remember there was this girl in my class named Jamie Burson who finished 146 of these things before I finished 2. And I distinctly remember thinking, I might be retarded. And then I looked at the wall and thought, Oh yeah, I am. So one night, I sat at the dinner table and said to my dad, "I think I might be retarded." And he said, "Hush!" Which is one way to address a problem -- just keep it under wraps. That's what my father would say whenever anyone told uncomfortable stories. So I developed this habit of telling uncomfortable stories. From Sleepwalk with Me And Other Painfully True Stories by Mike Birbiglia. Copyright 2010 by Mike Birbiglia. Reprinted by permission of Simon & Schuster Inc, NY.